LAS VEGAS (Jan. 23, 2018) – Mack Trucks recently launched the Mack Trucks Configurator, a new online tool that enables customers to build and customize Mack® Granite® and Granite MHD models virtually to see which specs are most effective for their applications. “The Mack Trucks Configurator presents customers with recommended specs for seven Granite applications, plus six more for the Granite MHD,” said Tim Wrinkle, Mack construction product manager. “Customers can then tailor several spec options to create a truck that best fits their specific needs.” Applications covered include tractors, concrete mixers and dumps, as well as rear loaders and roll offs for refuse. Once an application is selected, customers can select exterior, interior and chassis components, along with engine, transmission and axle choices. A 360-degree view of the exterior lets customers see their choices first hand. Once complete, customers have the option to send the configuration to their local Mack dealer for additional information and quoting. 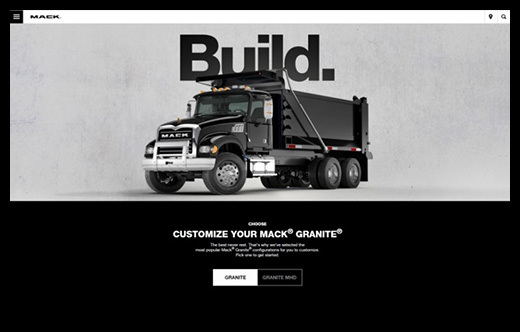 The shared configuration is also streamlined with Mack’s sales quote and ordering system, allowing customers to easily receive a quote on a new Mack Granite or Granite MHD model quicker than ever. Built in the U.S.A. with Mack’s legendary durability and reliability, as well as the latest pioneering features to improve productivity and performance, the Mack Granite model is the jobsite standard. Available in axle forward or axle back configurations, the versatile Granite model can be spec’d for a wide variety of construction tasks, including dump and concrete mixer applications. The Granite model can also be found in the refuse segment as a rear-loader or roll off, while municipal customers depend on Granite models for plow applications. For heavy-haul or logging applications, the Granite model can be spec’d as a tractor with heavy-duty upgrades. Customers seeking heavy-duty durability in a lighter weight class can turn to the Mack Granite MHD model, which is weight optimized and can be configured as a Class 7 or Class 8 vehicle. Additional Mack models will be added to the Mack Trucks Configurator in the future, along with new tools and options for customization. The Mack Trucks Configurator is available to the public and can be found at build.macktrucks.com.